You are here: Home 2012 May No two cancer cells are alike – time to individualize treatment! Dr. Weeks’ Comment: killing cancer TUMOR cells, even killing cancer STEM cells is not enough. Replenishment and optimization of the immune function needs to be the top priority. Now we see how infinitely challenging it is to kill cancer cells. So focus on the PERSON! Make certain your oncologist is willing and able to care for YOU and treat YOU and not just focus on killing your cancer cells. A new day in cancer treatment is dawning. Treatment is now being personalized by performing analysis of the tumor itself! This would seem to finally permit us to determine the very best treatment for a given patient instead of today’s approach that everyone with such a cancer gets that type of protocol. Patients with solid tumors frequently have tumor cells in the peripheral blood. Those cells can now be isolated and these can be used to personalize that patient’s cancer treatment. However, this report suggests that there may be no two cells in a tumor that are exactly alike. So, as exciting as this breakthrough is, we will still need to learn more. It seems that whatever cancer cells we isolate with these exciting new techniques, there appears to be a strong likelihood that there are other different tumor cells that would have led to the identification of a different course of therapy. All this is good news to move us beyond treating all breast or prostate cancers the same. There is clear documentation that chemo buys most patients at best a few extra weeks of life, but that life often has been so compromised by the chemo that living 2-4 weeks longer hardly seems like a winning approach even if someone else pays the $30,000-$200,000 today’s chemo all to often costs. A new study finds that cells shed from tumors express unique sets of genes, suggesting more targeted cancer treatments are needed. When it comes to the genes of cancer cells, there’s no one-size-fits-all , according to a new study led by Stanford University researchers. The team found that not all tumor cells express the same genes””and that includes cells within a single patient or even a single blood draw. In addition, the scientists found that cancer cells circulating in the bloodstream differ significantly from tumor cell lines used in drug development, suggesting that cancer drugs developed using those cell lines may not be effective against those circulating cells. 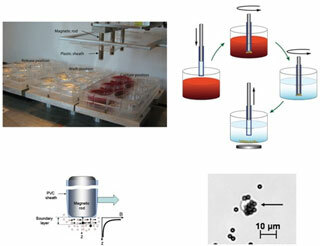 In the study published May 7 in the Public Library of Science ONE (1), Jeffrey and colleagues isolated the circulating cells from the bloodstream by using a device they previously developed that captures live tumor cells labeled with magnetic particles. The captured cells had less contamination from white blood cells””a common difficulty with separation of circulating cancer cells from the bloodstream””than has been reported by other research groups using different methods. Then, using microfluidic chips, the group performed real-time quantitative RT-PCR to simultaneously measure RNA expression for 87 cancer-associated and reference genes in single tumor cells. Such an analysis of circulating tumor cells could provide an accessible way of studying metastatic cells throughout disease progression, making it possible to tailor treatment to many different cell types. “The paper from Dr. Stefanie Jeffrey and her team is an important contribution to the field,” said Massimo Cristofanilli, a breast cancer clinician and chairman of the Medical Oncology Department at Fox Chase Cancer Center, in an email. He said it confirmed that tumor variation can be monitored using circulating cells, and that such studies can improve understanding of the process of metastasis. In the end, which genes should be targeted and how those cells might respond to different drug therapy remain unknown. Although the technique is not yet being used in clinical treatment, the group is currently developing a chip to test the drug response of diverse cells. “Hopefully, the end result is that circulating tumor cells will be able to help guide drug selection,” said Jeffery. 1.Powell, A. A., A. H. Talasaz, H. Zhang, M. A. Coram, A. Reddy, G. Deng, M. L. Telli, R. H. Advani, R. W. Carlson, J. A. Mollick, S. Sheth, A. W. Kurian, J. M. Ford, F. E. Stockdale, S. R. Quake, R. F. Pease, M. N. Mindrinos, G. Bhanot, S. H. Dairkee, R. W. Davis, and S. S. Jeffrey. 2012. Single cell profiling of circulating tumor cells: Transcriptional heterogeneity and diversity from breast cancer cell lines. PLoS ONE 7(5):e33788+.